2016 is upon us, and Austin has some really amazing events coming up for us lit nerds ! Happy New Year everyone! This month’s line up includes the President of The Dionysium himself, L.B. Deyo! Novelists Carolyn Cohagan & Brittani Sonnenberg and the wonderfully disturbing word bender Dale Bridges. Owen Egerton presides over this monthly event (1st Tuesday of every month), which is now in its third month at The North Door (502 Brushy St). As always, this event is FREE! Readings start at 7pm. Astronomy on Tap ATX is held on the third Tuesday of every month at The North Door at 7.30pm. It’s organized by professional astronomers Dr. Rachael Livermore & Dr. Jeffrey Silverman. This month Dr. John Jardel explains Dark Matter and how we know it’s there, Dr. Mike Boylan-Kolchin discusses how scientists search for Dark Matter, and Dr. Hayley Gillespie, the founder and director of the Art.Science.Gallery., discusses astronomy in art. “Science is even better with beer”, says AoTATX. Yes, yes it is. To celebrate the opening of the Edward Ruscha papers and art collection at the Harry Ransom Center, the Blanton and the Harry Ransom Center present a conversation with the artist on his life and work with critic Dave Hickey. Ed Ruscha is an American artist associated with the Pop Art movement and Beat Generation, and he has published more than 16 small art books. This event is FREE and open to the public. Priority seating goes to members starting at 5:20pm, and general admission starts at 5:30pm. Space is limited and available on a first come first served basis. Public reception to follow. The Blanton is located at the intersection of Congress Avenue and Martin Luther King Jr. Boulevard. See the Blanton Museum’s event page for more information. In addition to the above they also have a podcast that is currently on it’s 78th episode. The Austin Opera presents the English-language opera Of Mice and Men. Adapted by Carlisle Floyd, this opera is a faithful retelling of John Steinbeck’s iconic novella. Performances at The Long Center are January 23, 2016 at 7:30PM, January 28, 2016 at 7:30PM and January 31, 2016 at 3:00PM. Tickets start at $15 and are on sale now. Stage director Kristine McIntyre, known for her visually stunning and emotionally rich productions, has directed more than 50 operas throughout the United States at The Metropolitan Opera, Pittsburgh Opera, Arizona Opera, Dallas Opera, and many others. Of Mice and Men is an Opera in three acts, sung in English with lyrics projected above the stage, and features the Austin Opera Chorus & the Austin Opera Orchestra. So, if you are hosting, or just know about, a literary themed event here in Austin in the upcoming months, email sarah.h (at) bookpeople dot com and let her know about it (hopefully with at least a few weeks advance warning)! 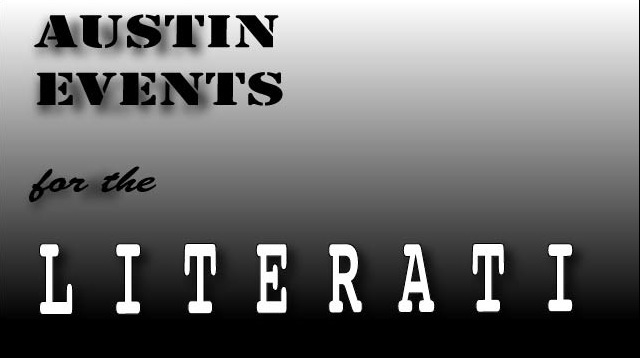 The Austin Events for the Literati blog post goes up by the 1st of every month. NOTE: These events are not produced by or affiliated with BookPeople. We just think they are great, that you’ll like them too, and hope to see you there! Next Post Josh Ritter @ ACL – Ticket Give Away!